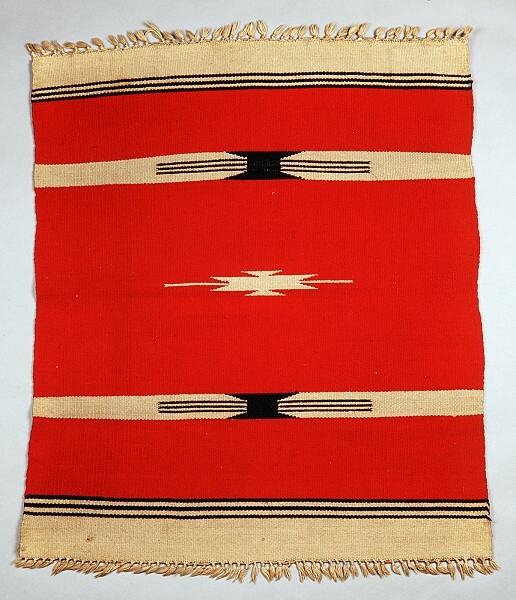 Blanket, Hispanic, early 20th century, New Mexico. Donated by Alfred C. Hawley in 1938. Department of Anthropology, National Museum of Natural History, Smithsonian Institution, cat. no. E379889, acc. no. 00150648. Dimensions: 30.5 in. (warp) (32.5 with fringe) x 25.5 in. (weft). Technique: Plain weave with short fringe. Thread count: Warp = 10/in. Weft = 20/in. Fibers: Warp = cotton twine. Weft = 3-ply wool yarn in natural white and dyed black and red, S-twist, Z-spin. Design: Primarily a red background with a white serrated diamond for a central motif. 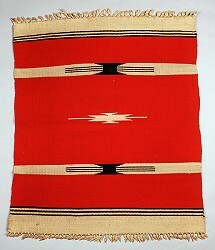 On either side of the central motif are white bands with black auxiliary motifs. The end panels are white with 3 black stripes.